I was (gently) chastised today for having been on holiday since Friday and for not having produced a single blog post in that time! Jo is probably right, so I thought I'd let you see what I'm working on now. Am definitely thinking a sleeveless version is on the cards soon! My first Mathilde! I am making this in a voile and so have underlined the bodice. I plan to leave the sleeves sheer. After much consulting with Katy and Marie, both of whom have made voile lined version, I have opted to go with Marie's method i.e. sewing the tucks on the fashion fabric only, but from there on in treating the lining (white cotton lawn) and the fashion fabric as one, therefore underlining, rather than lining it. Yep, if you press it on medium high, it melts! Right after you've spent an hour doing 6 pin tucks, obviously. Cue much swearing and an emergency trip to Mandors to procure a further 60cm of fabric! I still have the neckline facing to finish, the button placket, buttonholes etc to do and the sleeves to attach, but should be finished fairly soon. Maybe even by the end of the week if I can get some sewing time tomorrow or Friday. And that's one more wearable item for Me Made May! I am really trying hard not to panic sew for MMM, but it's hard not to! Ideas keep popping into my head along the lines of "oh, I could just quickly sew that up..." and suddenly my self-made wardrobe seems very small. I do have plans over the rest of my break, but on the off chance I manage more sewing, here are some other fabrics I have on hand and my thoughts on what I might do with them. Top: green and navy silk. I bought this with another Violet in mind. This may still happen, or it might turn into something else. My first Violet (not yet blogged, but you'll be seeing a lot of it next month!) has some fit issues that I need to resolve, so as much as I want another Violet, it's not a quick fix. Middle: blue and white striped linen. I have never sewn with linen and only bought this because in Mandors they'd made up a nautical inspired mannequin with this as a kimono sleeve top. I intend to replicate this and will probably just duplicate my graphic print kimono sleeve top, so it should be a fairly quick make. The stripes run vertically on the fabric, but I quite fancy them horizontal. Anyone foresee any issues with this? Bottom: bargain Liberty cotton lawn (£9.99 a metre!). This is earmarked for a Laurel blouse. I will probably make this first so I can enter the Laurel competition. I did have grand plans for the Laurel competition, but I haven't yet found the right fabric, so this may not happen. We'll see! In the meantime, I can make the blouse as I really like these versions:. Flossie Teacakes - isn't this beautiful? It's Liberty silk! Here's another picture of my fabrics. Can you see the lovely scallop pattern in the flowers? Hmmm. Maybe that would make a nice Laurel? Do you agree with my plans for these fabrics, or do you think I should do something different? What are you working on just now? 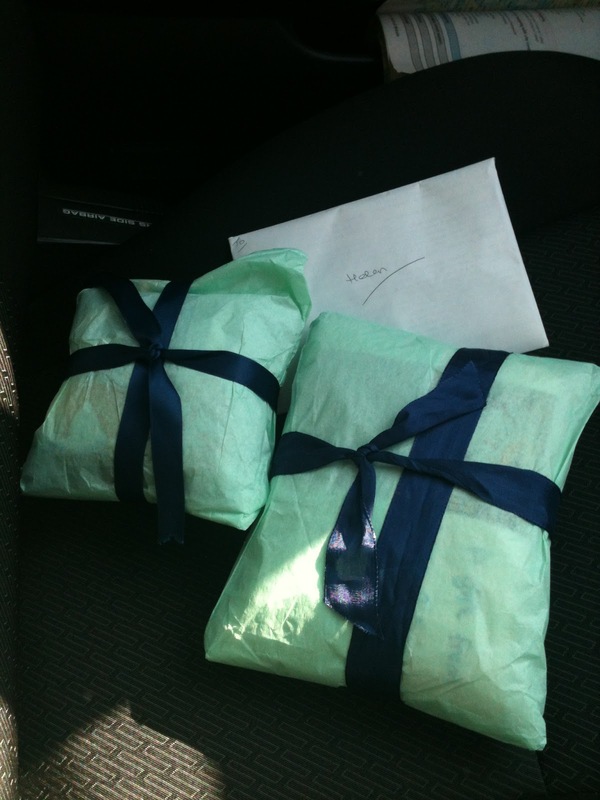 Next up: do you want to see what I received through the Nautical craft swap? As you can see, I was too excited to wait until I got home to open them, so here is a photo of the lovely packaging, taken in my car! I actually went straight to the hairdressers after this, so there was NO WAY I could wait that long to open it! And now some better pictures, taken once I got home, of the contents. A beautiful printed and embroidered lavender pillow. Isn't that vintage postcard print just fab? Needle case and pin cushion - both of which I needed! Look at the embroidery on the pin cushion - it's about a million french knots! The outside of the needle case - patchwork and lace trim on the back. And a gift of some very cute little pins! Louise absolutely nailed this for me! I had let her know that I love birds and an anchor motif, which she covered very well. I hadn't mentioned though that I also love seahorses, or that vintage postcard look, so she hit gold! And how funny that we both needed, and made, needle cases! This should be enough. I can also whip up a couple of additional simple blouses (am thinking Mathilde and maybe a Sorbetto) and possibly another Charlotte, or a simple skirt of some description, to bulk things out. Work will be a cinch as most of my makes are the kind of smart/casual that I wear there. It's weekends that will be trickier. My weekend uniform usually comprises of a striped breton tee with skinny jeans, and it'll be hard to give this particular addiction up. But then the challenge is just that. It's not meant to be easy, so this will hopefully get me thinking more creatively about my wardrobe. I will just need to get on top of my laundry to make sure I have something clean to wear every day! :) Not sure how I'll go with the photos, but I will try to capture as many outfits as possible, and will aim to post once a week, for my sanity as much as yours. What about you? Are you signing up for the challenge? What are you working on now? Joan dress. AKA Mad Men Challenge. AKA Elisalotte. AKA the fabric dilemma dress. Whatever I call it, it's done. C'est fini. Please ignore the wonky hair in these photos. I thought I'd make a token effort at looking a bit more Mad Men - hair up and a bit more eyeliner!. As you can tell, hair styling is not my area of expertise! :) and P neglected to tell me it was wonky before he took the photos. I'm in a state of ambiguity about this dress. I want to love it, and mostly I do, but there are some fit issues and the inside is a mess, so it is not as "nice" as I would have liked for a relatively smart dress. I LOVE the fabric. I am so glad you guys talked me into buying the more expensive one because it was so right for this dress. It was lovely to work with, it give some structure as it's fairly thick, its comfortable as it has a slight stretch and it looks smart as it has a slight sheen to it. And the print is extremely forgiving of errors! Although I am noticing in these photos, it's making me look strangely one dimensional, like some type of paper doll! I think it totally fits the bill for a Mad Men dress and I am really pleased with the similarity to the inspiration photo. Other than the colour, and my lack of curves to fill it out, I think it's pretty spot on. The ONLY pic you are getting of the inside of this dress and only because it's my first ever self drafted facing. OK, so I could leave it there and not point out the flaws and we could all pretend it is the perfect dress. But it's not and I'm keen to get your views on what's gone wrong. So here goes. Fit: It fits perfectly from the hem to the top of the bust and then it all goes slightly weird. There is too much fabric from that point up to the neck line. The neckline is too wide and so drops off my shoulders and the sleeves just don't sit right. Also at the back, there is some gaping at the neckline if I stand up really straight. My thought is that it's just too big in this area. What do you think? I cut a 12 for the bodice and skirt, based on my bust and waist measurements, and it fit fine here without any adjustments needed (other than for length of bodice, but we'll come on to that). I was meticulous about stay stitching the neckline, so it can't have stretched (plus that wouldn't explain the sleeves, would it?). I did adjust the neckline, but I did so based on a pattern that is my size (although, admittedly, I haven't actually made that dress, so can't say for sure it fits me). But I only widened the neckline. I didn't touch the shoulders. The armscyes/armholes should be exactly where they were intended to be. I did make a muslin of the bodice, which seemed OK, but I really only focussed on checking the bust and bodice length and so never attached the sleeves, or really paid much attention to the shoulder or above bust area. Looks like there is some excess fabric across the back, just above the waist, which I hadn't even noticed before! So, what do you think? Should I have maybe graded down a size in this area? And crucially, is there anything I can do to fix this now? On the plus side, it can't actually fall off my shoulders as it's too tight. It does feel a bit weird though, wearing a strapless bra with a dress with sleeves! Second negative: the inside is a mess. I opted not to line the bodice (the pattern has you do this) as I didn't know what to line a stretch fabric with. 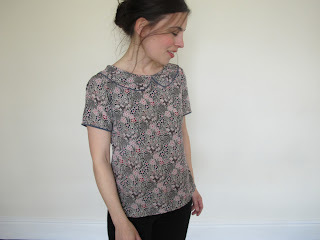 Instead I drafted a neckline facing, which worked pretty well - see above photo. So, I should have bias bound the raw edges. I would have been the right thing to do. But I didn't. I didn't have any bias binding tape and I couldn't be bothered to make it, and with all those seams it would have needed metres and metres! And if truth be told, I actually just couldn't be bothered. I've written previously about my frame of mind when making this. So I zigzagged all those seams! It's not the end of the world, because actually no one will see that, but I feel the inside doesn't match the outside and it takes something away from the dress. Especially since seeing Katy's Tessuti dress, which is beautiful both inside and out. Something to bear in mind for next time, I guess. Oh and I'm extremely embarrassed to admit that there are at least 4 different colours of thread on this dress. I know! Cardinal sin of sewing! But I was trying to use thread from my stash, so I started with a dark purple, which ran out (all that zig zagging), then moved to a lighter purple, then managed to get an aqua colour in there too (bizarrely, my bobbin ran out, and the machine seemed to just carry on with the thread that was underneath almost without a gap. How odd! And it was the facing and is inside and it seemed pointless to unpick it all again...), and finally a white thread for the skirt and sleeve hems! The darts on the skirt don't match up with the princess seams on the bodice. This actually isn't a biggie. I did make an attempt to move the darts slightly, but then adjusted the length of the bodice a couple of times, by which time, the darts were off again. But that busy print really obscures this. On a plain fabric it would look noticable, but on this fabric you can't see it. As I said, not a biggie. I had a few nightmares making this dress. As I mentioned above, I lengthened the bodice by 2 inches, then sewed the bodice and skirt together, zig zagged the edges then tried it on. And realised the waistline was about 1.5 inches too low. It took a couple of attempts to get it right, but I got there in the end. After quite a bit of unpicking. I also had some issues with the zip. Some of you may remember I initially planned to move the zip to a side zip, just because I fancied it. But then I realised that this would mean I'd need more fabric than I had bought (as both the back bodice and back skirt pieces should really then have been cut on the fold), and that it would also mean I couldn't have a vent at the back of the skirt. So, I reverted back to the original back zip, replacing the exposed one with an invisible zip. I like invisible zips. I think they look sleek and professional and I have never had a problem inserting one. Until this dress. Again, I don't know if this was my frame of mind, or just carelessness or lack of luck, but I kept getting it wrong. At one point, I even managed to sew on top of the zipper coil, which I can tell you was a nightmare to unpick! I got there in the end and the zip is now fine. Back to a positive: I did use seam binding for the skirt hem, which looks nice and neat, and makes me wish even more that I'd bias bound the raw edges! I found the making up of the bodice sometimes problematic. None of the notches seemed to match. No one else has mentioned this in their reviews, so it may well be a tracing error on my part. I will need to check this before I make this again. And there will be another one. Next time, an unadulterated version. I love everyone else's versions, so I am super keen to make myself one that I'm happy with. In the meantime, what do I do with this? Do I wear it as is? Can I fix it? Do I order more fabric and re-make the bodice and sleeves? Or do I cut off the bodice and just wear the skirt? It would be a fabulous skirt and I probably have just enough fabric left to make a waistband! Any suggestions, gratefully received! And finally, can we all just pay particular attention to my new shoes? Please excuse the "pealy-waly" (pale) Scottish legs! Guess how much? Go on, guess! £8.50 from our super-cool new local charity "boutique", which opened on Saturday. Jo has blogged about it here. What a lovely surprise this week to discover that Katy has nominated me for Liebster Award! I was grinning from ear to ear all day long - and it even led me to tell more people about my blog. For some reason, IRL I've kind of kept my blog a bit of a secret. TBH, until this week the only people that knew about it were P, my brother (a sometime food blogger) and a friend (a fashion blogger). Is that weird? I think this is due to a level of embarrassment and shyness, but also because I never actually believed I would stick with the blog. I didn't expect to enjoy writing it so much and never, in a million years, thought I'd be nominated for an award! And what a lovely introduction from the gorgeous Katy! When I first came across Katy's blog I almost didn't follow her, purely out of jealousy! I would look at the items she has made and think - how on earth is she managing to produce such lovely, creative, quality garments when she's been doing this for such a short time! The answer is the girl is a natural - she is creative, clearly passionate (bordering on obsessive, but aren't we all?) and has boundless energy. And she doesn't have a nearly 3 year-old, so therefore has the most precious of resources; TIME! I have talked a bit about this here, but here's the short version: my mum always sewed when I was little and I liked to join in and to help. Throughout adulthood, I always fancied it, and always had a sewing machine, but never really got into it until I decided to attend a night class over 3 years ago. After the Small Boy arrived, I got more and more into sewing, and once I discovered Indie pattern makers and the online community last year I fell, hook, line and sinker! 3. Have you tried designing your own clothes, is this something you'd like to try in future? No and yes. I have played around with existing patterns to take them in different directions (see here and here), but that's as far as I've got. I love the idea of being able to make something from scratch, and look to Katy for inspiration on this. This! An award! Recognition and support, and all the lovely comments that my regular followers leave. I am thrilled that people think my blog is worth reading and that what I'm sewing is half decent. It's more than I ever expected. And the fact that SoZo has commented on my blog a couple of times. A "real", "proper" blogger. One of the cool girls! 5. Is there anything challenging that you haven't made yet but would like to? Yes. Trousers. Also a coat and a tailored blazer. And a shirt. I am especially proud of the bag and needle case I made recently for House of Pinheiro's craft swap, as I took such care over them. I am also proud of my Kelly skirt, which is almost as nice on the inside as it is on the outside, with really excellent top stitching to boot! 8. What is the nicest compliment you've received for something you've made? I love the idea of making money from something I love, but I very much doubt I will ever do it, mostly from a fear that I might end up hating/resenting sewing if I HAD to do it. But the idea of doing something similar to Tilly, i.e. releasing the occassional pattern, really appeals. I have a LOT to learn first though. But if I ever win the lottery, I will open the haberdashery shop of my dreams! 10. Are you a perfectionist or a "get it done" sewist? Absolutely a "get it done" type. I need to learn to be more of perfectionist so I can be happier about my makes. And now my nominations. I have struggled with this a bit because it appears that most of the blogs I follow have more than 200 followers, so I've failed to get 10. I've also included a few non-sewing blogs in the mix too. One Small Stitch - Danielle is a fantastically talented costume maker who has fairly recently got into sewing for herself. She is also incredibly supportive of both my writing and my sewing.You should check out her Sewing For Victory dress to see how good she is! The Polished Button - I came across Ruth via SoZo (I think), who recommended her vintage button shop on Etsy. Ruth was amazingly helpful in finding me some buttons for my 60's coat (still to come to fruition, sadly), as I had something quite specific in mind. I only recently realised she also has a blog, which is a bit of sewing and making and a bit of her life. Adventures and tea parties - a crafting, rather than a sewing blog. I have written here about the lovely brooch that I won, that Jo made and designed. If you like this, check out her blog and Etsy and Not On The High Street shops. Best Dressed Babe - Another Jo, this one my friend. So yes there is an element of nepotism here, but this is also genuinely nominated. Jo is a budding fashion blogger, her blog is informative and fun to read (and without the preachy "you must wear this" of some fashion blogs) and fairly Edinburgh-centric, which also makes a nice change! Bobbins and Whimsy - I find it hard to believe that Jenny has less than 200 followers, but according to Bloglovin, that is the case. No idea how I came across Jenny's blog, but I love her writing and what she makes. She put tons and tons of work into her SFV dress, which was stunning. Vintage Follies - Again, I doubt very much that Cherise really does have less than 200 followers, but again this is true according to Bloglovin. Cherise's vintage style is to die for and for me she is up there with Rochelle and Casey for style inspiration. 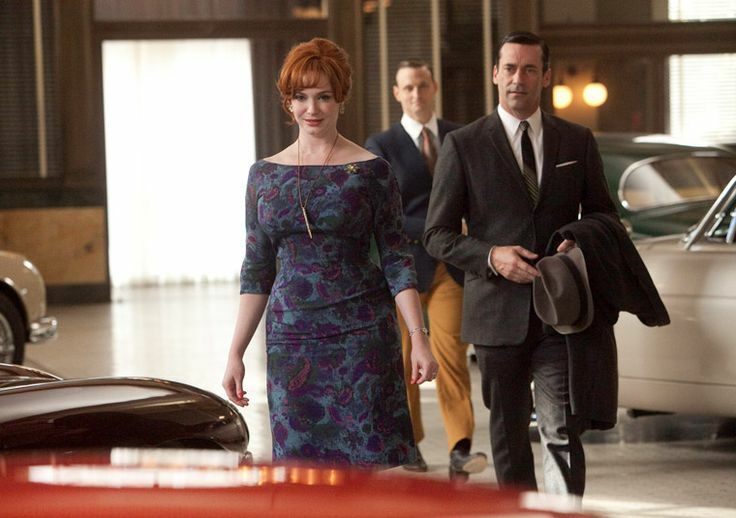 Check our her SFV and her Mad Men dresses. Finally, I am reserving one nomination for my brother's blog, on the condition he starts it up again! He started it last year to record the food he ate on a 3 month work trip to Mexico. Since returning, he's given it up, but I'm hoping he restarts it. He's a real experimental foodie (crickets, anyone?)! UPDATE - I have to admit I was very tired and it was quite late when I wrote this post last night, and as soon as I went to bed, it occurred to me that I had somehow missed a couple of key blogs that I follow, and that I would like to nominate! So, sorry guys! Nessa's Place - Nessa is a dressmaker and craft-maker, who has made some truly lovely things. Check out her nautical craft swap item! Heavenly Handmade - Alison is a local (to me) craft and sewing blogger that I discovered via the Sewintist map, who makes some really lovely things! Both Nessa and Alison have been hugely supportive on my blog and I can't believe that I didn't include them when I wrote this post! A huge SORRY to both of you! There are a few other bloggers that I would love to nominate, but Katy beat me to it, including The Amazing Taracat, Honig design and The Little Tailoress. 1. Why did you start sewing/making? 2. What's your favourite part of sewing/making? 4. Who is your muse/style idol/style inspiration/style crush? Can be real or fictional. Famous or civilian. 5. What is your make? 7. What's your sewing/making bete noire? Your biggest challenge, or the thing you've been putting off? 9. Do you have any other hobbies, other than sewing/making? 10. What is your sewing set up? Do you have a dedicated sewing spac? Are you relegated to a corner of the living room? For my fashion and foodie blog nominees, feel free to answer what is relevant from above, adapting the questions as necessary (e.g. who is your inspiration on your blog subject?). Along with everyone else it seems, we've been having a decidedly wintery spring so far. However the sun now appears to be making its presence seen, if not yet felt (yup, still wore a scarf and gloves to the swing park today. In April! 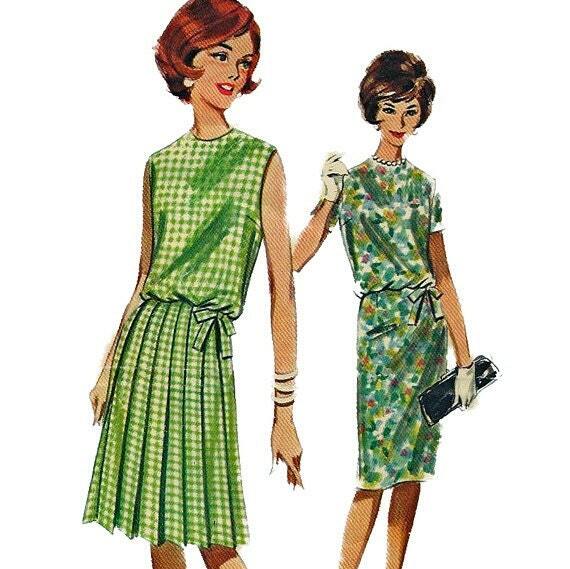 ), and this therefore puts me in mind of what I might like to sew and wear this summer. I've never been one for deciding these things in advance. I've never felt the need to create a mood board for my wardrobe, being more random, impulsive and just plain fickle in my approach. I tend to see something, like it and therefore buy/make it. I might covet an expensive or hard to make/source item and carry that thought around with me for a bit, or I might have a crush on a particular style or item that carries through for a while, even year to year (e.g. pleats, or breton tops, or the colours green and coral), but I don't think I've ever come up with a "look" for the season ahead. I've even admired Colette's Palette Challenges from afar, appreciating the idea, but deciding it not for me. I don't even have the inclination, skill or knowledge on how to create such a thing! At some point, this year though, that has changed. I don't know if it's because I'd got to the stage where just making random items of clothing, as and when I found a pattern or fabric I quite liked the look of, has resulted in surplices and deficits in my wardrobe and in my sewing skills. Or whether something from reading others' blogs has rubbed off on me. Or if it's discovering Pinterest. Or if it's just for once I've been struck by inspiration all on my own (regardless of what the magazines would have me wear)! 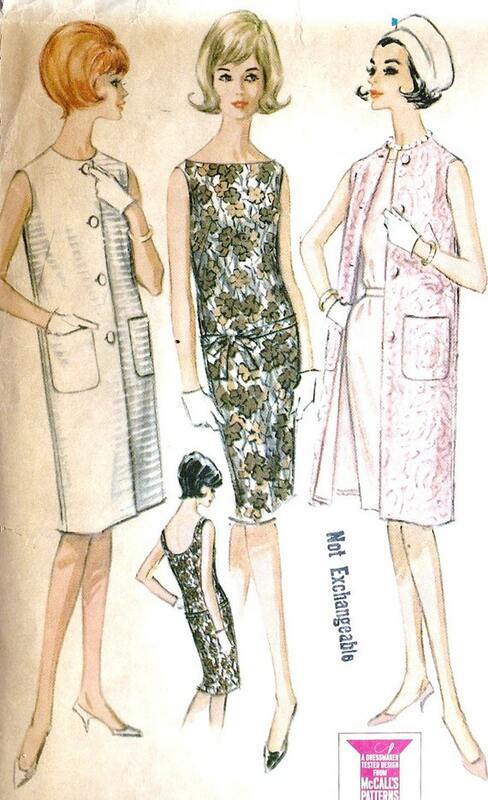 But what I do know is that for me, spring/summer 2013 will be all about the Sixties. Now I'm not talking Mary Quant/Vidal Sassoon kind of 60's, more a relaxed, casual approach, which is a vision I have in my head, but I've struggled to find pictures to support from the actual era, so I may have just made it up. But it's capri pants with ballet flats and gingham sleeveless blouses. It's knits with pleated skirts and kitten heels. It's shift dresses. 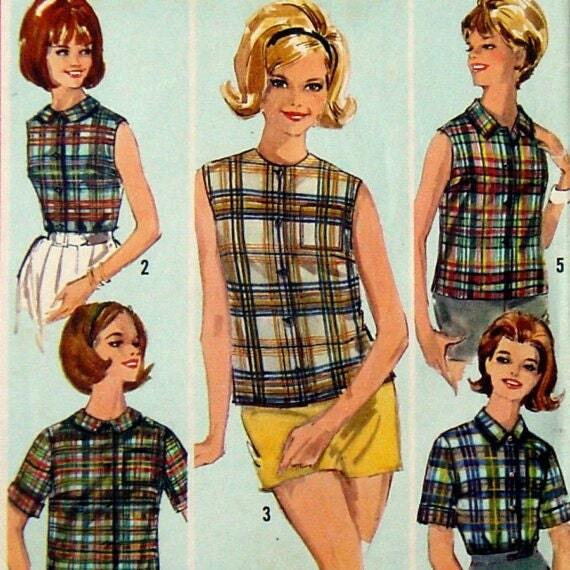 It's button back blouses with peter pan collars worn with pencil skirts. It's Brigitte Bardot in a breton top. It's An Education. (all photos from my Pinterest boards, unless otherwise stated. Very lazy referencing, I agree). OK, so An Education is a bit more formal, but you get the idea. There is definitely a scene in the film where Jenny rocks the capri look, I just can't find a still of it. 1. Cropped/capri trousers. I have never made trousers, but I am totally inspired by these and would love to make something similar. I have signed up for this Craftsy course, which I am hoping to use to copy some RTW trousers I already own. 2. Gingham sleeveless blouse from view 2 of the plaid blouse pattern, top right above. 3. Another summery (bright) Charlotte pencil skirt. Or 2. 4. Laurel shift dress. Isn't this pretty? 5. 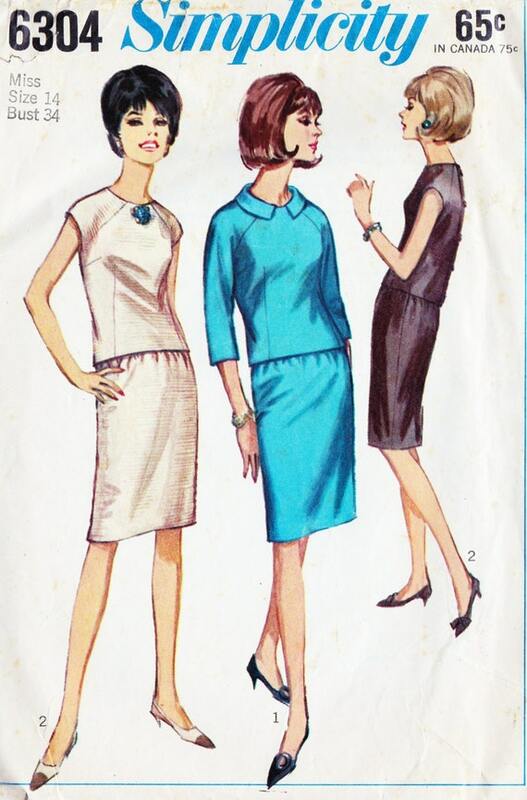 Either the knife pleat dress above, or the top left sleeveless dress in the patterns above. Or both. 7. Blouse and possibly also the skirt from the Simplicity 6304 above. 8. Another Sorbetto (previously made one, not yet blogged). And/or a Deer & Doe Datura. 9. Oh, and look a pretty summer coat! (I can tell you now, this one will not happen unless I win the lottery, give up my job and start sewing full time!). 10. A Mathilde, with either slimmed down, or no sleeves. This is quite a lot and I've actually just listed these without even consulting my current wardrobe, so some will definitely not come to fruition. But I guess this list, in itself, acts as inspiration. If I am tempted by a sewalong or challenge, or a new pattern release, I just need to refer back to this post and remind myself that doing something else will mean achieving one less thing on this list. There will be other items I want to make that don't feature here (another Kelly, a coastal print Miette and a "proper" Elisalex, to name 3), but I'm OK with that. Again, I just need to decide which I need or want more. This post isn't a binding contrast, it's a brain dump and a curated, cherry-picked Pinterest summary. And most of all, it's designed to cheer us all up and get us in the mood for summer! After all, if we start behaving like it's spring, maybe the sun will start to get the hint! Do you have any thoughts about your Summer wardrobe (or upcoming Winter wardrobe if that's more relevant!)? P.S. On a related note, I have finished my Mad Men dress! Hurrah! Post to follow once I get some photos taken. Firstly I want to say thank you all so, so much for your lovely words of support on my last post. It really means a lot to me that you have been so kind and understanding. It constantly amazes (and pleases) me that the online sewing community are so supportive of each other, even about non-sewing stuff. How lovely, yet slightly bizarre, that we can gain so much from people we have never met! Thank you! Some weeks ago, Rachel at House of Pinheiro announced a Craft Swap, with a nautical theme. I thought this would be an interesting challenge, because, as I've mentioned before, I don't really craft. I sew clothes. And I very, very rarely make anything for anyone other than myself (and those very, very rare occasions have been toys for Small Boy - hardly my toughest critic if the quality isn't quite there!). I initially planned to make this bag, which I came across on Kerry's blog, as it looked nice and simple and useful. But Shar mentioned that she was planning to make this bag, which I hadn't come across before and which I thought I would personally prefer to own, and so decided to copy take inspiration from Shar and make this instead. I preferred that it was lined and that the wide opening meant it would be easy to find things inside. If you have not come across Noodlehead's tutorial, and you would like to sew a similar bag, I urge you to take a look. She has written a really clear, comprehensive tutorial which was so easy to follow, I have since made another one for Small Boy. I bought both fabrics as fat quarters from the Quilt Show back in February, but seem to have deleted the photos I took before I made the bag up! The exterior is a pink and off-white lobster print, which I used on the cross grain, as I thought the lobsters looked better going round the bag, and the lining is a pale blue and white seahorse print. Both are gorgeous, and, I thought, an alternative take on the theme. I bought the fabric before I was partnered up, but as it turns out, Louise's favourite colour is pink! How serendipitous! I am ridiculously proud of my zipper insertion. The bag was very easy and quite quick to make (would have been quicker had I not sewn one of the lining pieces on upside down...), and it felt like a bit of a cheat to give this only, so off I went to Pinterest to look for something else. I came across this needle case Pinned on one of Louise's boards. It took a couple of attempts, but I got there! I am exceptionally proud of this! As you can see, I used the same lobster print, but this time for the lining. I didn't want the items to be too matchy matchy, so for the exterior, I bought a different fabric which is a really cute "coastal town" print quilting fabric. I'd love to make a skirt or something from from this fabric (Tilly's Miette?). As you can see, a directional print doesn't really work on the outside, as you send up with bits upside down, but on a busy print like this, I think you can get away with it. The button came from my stash. I would have loved a wee anchor button, or something similar, but I didn't see anything I liked. I'm not pleased with the black popper, but it was the only one I had, and I wasn't about to head back out to the shops just for the sake of a popper! The card is by Hand Press Print. 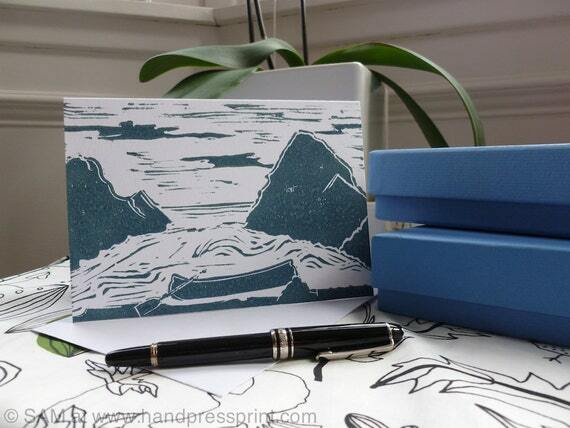 SAM is a local, Edinburgh based artist, who makes lino prints as cards and prints. I came across her work at a craft fair back in November and took her business card. I wanted to try to stick to the nautical theme for the gift, and remembered she'd had some sea-inspired prints, so had a look at her Etsy shop and came across this. The image is inspired by the Scottish coastline. I love that this is such a beautiful card, that it's representative of the country in which I live, and that I was able to support local talent too. And it was all a success! Look at this lovely email that I received from Louise today! The postman has been and I am one happy bunny! It's a lovely parcel from the gorgeous wrapping paper to the lino print card. You're obviously a very talented sewer, my lines are no where near as straight as yours. I think I'm going to be using the bag when I take my sewing out. The needlecase will live next to my pincushion(s) and keep my needles in there rather than have them lost in the pins. It's been one of the things on my to do for myself that hardly gets done, so thank you. I love the card too, how did you know I like Scotland? That'll be framed and put up in my workroom. I just hope you like what I'm making for you as much as I like yours. Not sure I'd describe myself as "talented", more "super careful when making something for someone else". I have really enjoyed making these items. I was a little daunted about making something for someone else, particularly as I'm not overly perfectionist in my attitude to sewing. But I didn't want to let Louise, or Rachel for that matter, down. So I took my time. I kept it simple. And I was very, very careful. The result has been 2 items that are perhaps not the most technically inspiring and perhaps don't give the "wow" factor, but of which I am really, really proud. And most importantly, have brought joy and pleasure to the recipient. And who doesn't like getting something pretty and useful through the post on a Thursday April morning? !